Now you can experience "Special Occasion" fine wines as a member of the Limited Series from your WINE OF THE MONTH CLUB™. "Super Premium Wines at less than Premium Prices." If you appreciate the delicate subtleties of a fine premium wine, the exceptional special occasion selections you’ll find in THE LIMITED SERIES monthly subscription club are bound to please. You’ll receive two remarkable limited production treasures, 12 times a year. Because these hard-to-find “boutique” wines are in such short supply and are typically not found in stores, this may be your only opportunity to experience their remarkable character and taste. And with this premium wine club, your pleasure is fully guaranteed. Make no doubt about it. The remarkable wines waiting for you in THE LIMITED SERIES monthly wine membership are exceptional by anyone's standards. Why do we call them Special Occasion? Simply because these are the finest examples of classic collector wines that most enthusiasts hold aside for special occasions. More expensive? Yes. But. . . The only true test to determine whether or not a particular wine is exceptional or memorable is to experience it yourself. And each month, our panel of distinguished wine authors and critics do just that. In fact, during the course of a single year, our panel of distinguished wine authors and critics tastes and compares more than 1200 different wines! Only the very finest examples of the premium quality wines are selected for THE LIMITED SERIES monthly wine membership. These are wines that represent the upper tier of the wines that we taste. Wines in this premium wine club are limited in availability because of their pedigree. 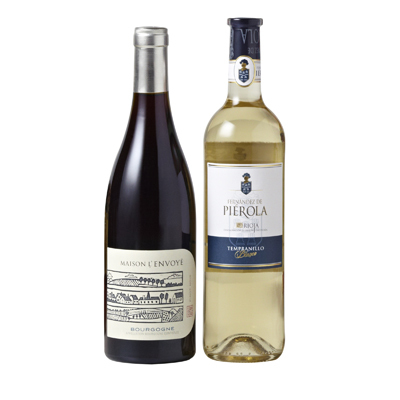 Compare with wines in your wine shop at $25.00- $30.00/bottle. Monthly subscriptions are never more than $45.96 per month for 2 bottles, plus shipping & applicable taxes. Membership from Wine of the Month Club on Vimeo. I looooove the wines from this wine club! I was totally a red wine drinker before I joined, but now I love white wines so much that I think I may just switch to 2 whites instead of mixed! Wine of the Month Club has to-die-for Sauvignon Blancs! My friends are all jealous! BEst thing since sliced bread. No, better. I love it!! It's a great deal because these are very rare edition!! I love this collections and recommendations. I don't have the risk of buying a just any other wine. Rare wine is now easily accessible! Yes! Great for my anniversary, birthdays, and more. I like the fact that these were easy to attain and at an affordable price! Me and my husband love these!! I always impress my friends when they find out that I have limited edition wines on the regular basis. Bought this membership for my boyfriend and myself. We both love wine but don't have a lot of money to blow on wine, so we went with this club after several of our friends recommended it! Very pleased, love the service, the packaging, and of course the wines. I love the Limited Edition! I use my limited edition wines for many of my special occasion. They have really good wines that I haven't seen anywhere else for these prices. If you go to a restaurant and get a wine that tastes this good, it is much more expensive and you can't get these at Safeway either. Love the tasting notes and binder too. Purchased 3 months of this series for my elderly father, who I take care of in home. The doctor said a couple glasses of wine a night should do him good so I decided I get him some wine. Not knowing where to start, I asked for help from my wino friends and they pointed me to Wine of the Month Club. I sit down and have a glass with my dad a few times a month. These wines are really good! And I'm not a big wine person etiher. I've been a member for more than 20 years and there's a reason why. Actually, there are many reasons. First, this is the best wine club you will ever find, I don't care what anyone else says. The wines are always top quality, especially for the price point. The customer service is also spectacular, and the owner is very friendly as well. I have spoken to him on the phone several times over the years. Very nice, keep up the good work! I joined this club a couple years ago at Classic Series and quickly moved up to the Limited. They are all great! Just because the Classic series is cheaper doesn't mean the wines taste less good. Would recommend to all my wine loving friends out there.